Luke Porter of Luke’s Toy Store just released a new customizable Minimate kit. Unlike his previous kits of zombies, ninjas, skeleton lords, aliens or ghosts, he has taken the “kit” one step further and created his very own comic book to go along with it! It’s called ProtoPlanet and the comic follows the adventures of a team of scientists and soldiers that need to see through the formation of “Proto planets”, or planets that are specifically designed for various tasks by the sponsor. These scientists usually end up “guns blazing” or so Kaim, the main Scientist/Soldier reflects on during the latest adventure. I quite enjoyed the story of the comic, and I would be more than happy to read more issues. Luke has photographed the Minimates masterfully and given them some artistic rendering that works really well. This first comic reads like a classic issue of X-Men, with plenty of action and story to keep the reader engaged up to the usual “cliff hanger” last page. Luke is a comic fan, and his great first issue reminds me of what I enjoy about comics. I can’t wait to see how the story unfolds and what other surprises exist in this universe he has created. 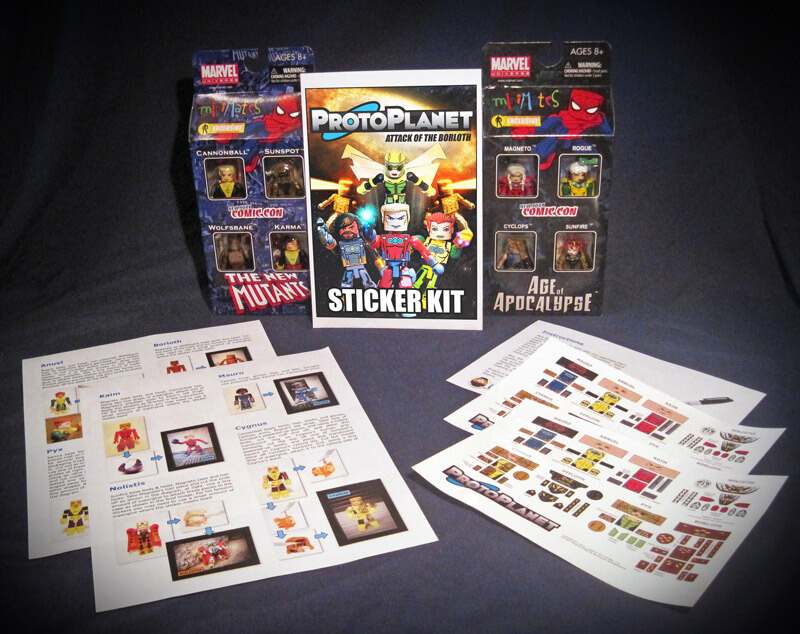 Luke’s toy store offers the chance to then create your own ProtoPlanet Minimate figures with his sticker kits that are available in a few different packages. You can either just pick up the sticker kit by itself or pick up a set that includes the Minimates that work best with the stickers. The Deluxe kit pretty much gets you everything to re-create the comic, with even more characters and even face variations. Even if you just wanted the Minimates that came with the kit, you would be saving money. However, I can’t imagine not buying this and not wanting to create the custom figures. Especially the Borloth, Dieloth and the “Master” Nolistis. They are very nice creature designs. In short, I think this is a great and extremely creative idea. Even though this is recommended for adult collectors, a kit would even make a great a great gift for a skillful older kid or teen that would enjoy the customization aspects.